The towering Grunwald Monument is an important symbol of Polish National Pride. It stands in commemoration of one of the most important victories in the shared history between Poland and Lithuania. This was at the Battle of Grunwald which was one of the largest battles in Medieval Europe. On July 15 1410 the combined armies of Poland and Lithuania fought against the Teutonic Knights. These Knights of the Teutonic Order were a German military and a Christian religious order of the Middle Ages. And their mission was to convert the Pagans of Eastern Europe to Christianity. Since almost 200 years of the Crusades, the Order had occupied vast territories in the East. Consequently Eastern European cultures felt under threat of becoming completely Germanized. With the Order’s forces being so large, there was no other option than for Poland and Lithuania to merge their common defenses and go into battle fighting side by side. The striking 24 meter monument was inaugurated to celebrate the 500th anniversary of the victorious battle. In front of it, an estimated 150,000 people witnessed it’s unveiling in 1910. 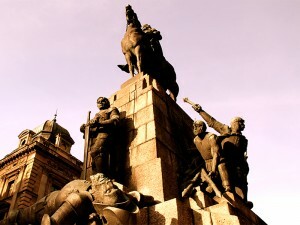 You can see that the monument displays the battle’s main protagonist including the King of Poland, Władysław Jagiełło sitting atop his horse. Moving on, the Grand Duke Vytautus of Lithuania is standing at the front with his sword pointing downwards. 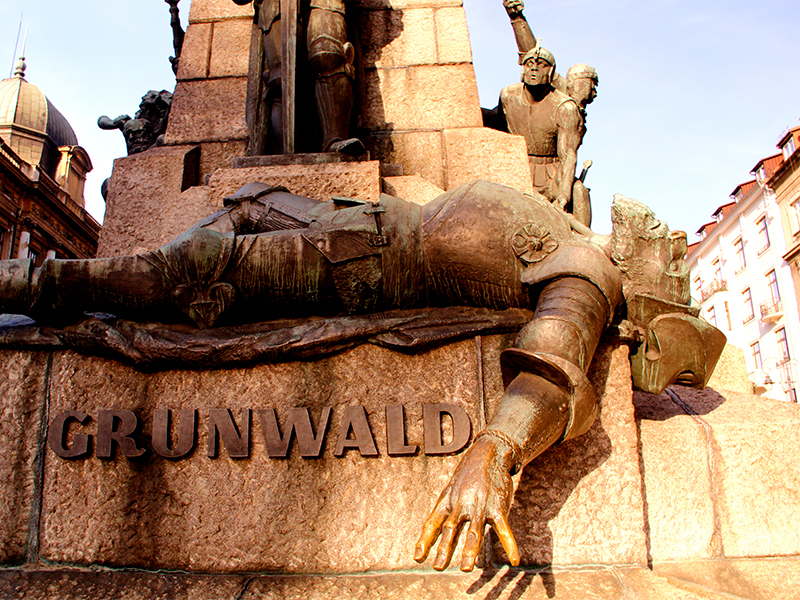 Then looking down, you have the Teutonic Order’s Grand Master, Urlich von Jungingen, dying in battle and he is shown on his back beneath the proud Duke. He doesn’t look very comfortable! If you walk around the sides of the monument, you’ll see soldiers from both armies. 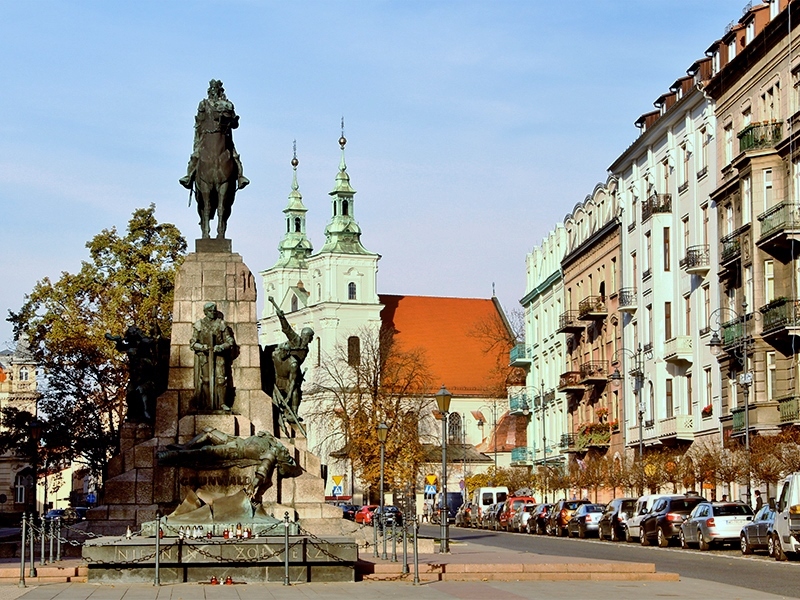 The original work was by the Polish sculptor Antoni Wiwulski. It was he who also designed the piece, on a commission from Ignacy Jan Paderewsk. He was a famous Polish pianist and politician. Only when you actually approach the monument and see it in close up, can you really appreciate the detail. Errr…sorry to say, but that wonderful monument you’re looking at today is a replica of Wiwulski’s work. Unfortunately, the original was destroyed in the Second World War by the occupying Nazis. The impressive recreation was by Marian Konieczny. It dates back to 1976. The Grave of the Unknown Soldier made of marble and bronze and designed by Wiktor Zin, is in front of the plinth.